We know you have questions about preparing your children for the CogAT, OLSAT and NNAT. Below, you'll find answers to the most common questions we receive around these exams. You'll also discover why TestPrepExpress.com is the right choice for affordable, effective online test prep. If you have a question that's not answered below, you can always reach out to our Customer Support Team. They'll be happy to get you the answers you need! Can you guarantee passing the test if we use the practice materials? No. Since every testing situation is different, we cannot guarantee that using our practice materials will produce the desired test results. We offer materials to help prepare for specific tests or assessments; however, you are responsible for practicing additional methods that will maximize your child's chance of success. Do you auto-renew my membership? No. There's no auto-renew for you to worry about or account for you to cancel. We charge a one-time payment when you purchase 30-day or 60-day access. After your membership expires, you will no longer see our paid prep materials in your account. If you would like to maintain your access after your membership has expired, you can always purchase additional time. Are your questions from the actual test or from old tests? No. The questions on the actual tests are protected by copyright. We are not allowed to use them, nor do we have direct access to them. What we offer are questions modeled off of the types of questions found on the exams. All of these questions, developed by our experienced educational team, are designed to give your child familiarity with the questions he or she will see on Test Day, as well as the skills he or she needs to pick the correct answer. Can I purchase more than one test and grade level? Yes. You can add on additional tests and grades for an additional payment. Additional access is available in 30-day and 60-day packages. Due to the nature of these materials, we regret that we can't offer refunds. If I have a technical issue with the website, what should I do? Send us an email at help@testprepexpress.com. We’re online seven days a week and typically respond to customer requests within one business day. Be sure to tell us what device, internet browser, and operating system you’re currently using. Please include screenshots of the issue whenever possible. These details can help us find and fix your issue even faster! Our site is best used with Google Chrome or Safari browsers. We do not offer free trials. However, we do offer free practice questions for each test, so you can get a sense of the materials we offer prior to purchasing. See our practice questions for the CogAT, OLSAT and NNAT. Are practice questions available as soon as I join? Yes, questions are available immediately after your payment successfully processes. After payment, you will be immediately logged in to your practice dashboard. You’ll see the interactive questions and printables available for the test prep package you purchased. How can I learn more about the CogAT, OLSAT or NNAT? What types of questions are on the exams? Discover more about how a TestPrepExpress.com membership can help your children maximize their scores on the CogAT, OLSAT and NNAT. Where can I see more CogAT sample questions? We'll walk you through the types of questions on this page. We also have interactive practice questions for you to try as well. 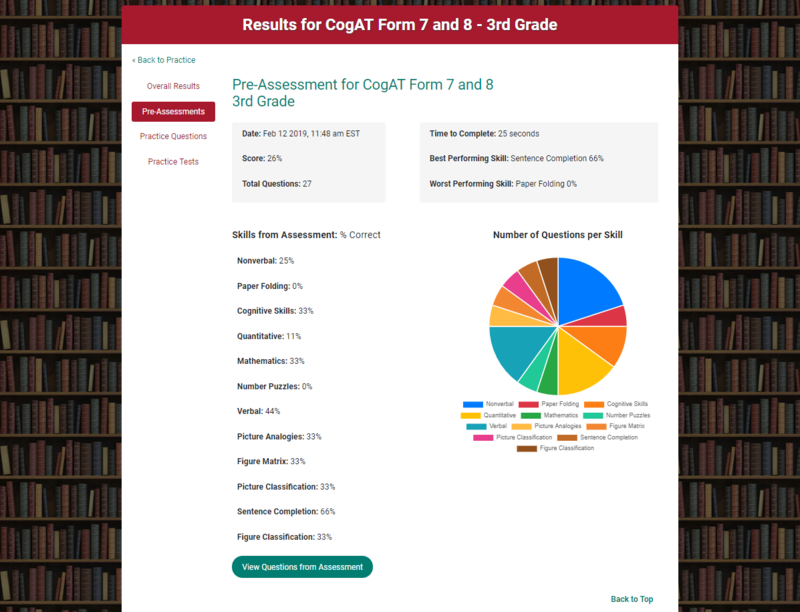 Your TestPrepExpress.com CogAT membership offers you and your child an additional 300+ practice questions to improve your child's skills and confidence on Test Day. Where can I find free practice questions for the OLSAT? You can try a sample of our interactive OLSAT practice questions here. Additionally, your TestPrepExpress.com OLSAT membership offers you and your child 300+ additional practice questions to improve your child's skills and confidence on Test Day. Where can I find free practice questions for the NNAT? You can try a sample of our interactive NNAT practice questions here. Additionally, your TestPrepExpress.com NNAT membership offers you and your child 300+ additional practice questions. Why should I choose TestPrepExpress.com to prepare my child? When it comes to preparing your child for school tests and entrance exams, you have a number of choices: books, flashcards, websites, tutors and more. Your membership includes a diagnostic that evaluates your child's current level in all of the major types of exam questions. The chart-based results will help you understand exactly where your child needs to focus to improve his or her score. We also feature targeted, interactive practice questions that will help your child strengthen any challenge areas. Finally, to help your child get comfortable with the exam, we also offer two full-length practice exams, one online and one in a printable format, so your child can walk into Test Day with the confidence that comes with preparation. Membership starts at just $14.99 for 30 days of access, which starts instantly—as soon as your payment processes. There's no auto-renew or repeating charges to worry about, and you can always purchase more time as needed. Who is the educational team behind TestPrepExpress.com? With 30+ years of combined experience in preparing children for school tests and entrance exams, the TestPrepExpress.com educational team wanted to create a cost-effective, convenient solution for CogAT, OLSAT and NNAT prep. Using their experience, in helping over 400,000 families, our team created the TestPrepExpress.com resources to help families prepare their children to maximize their potential on these important exams. When you choose TestPrepExpress.com, you'll get access to effective test prep that's been tested and proven to work—and you'll get it all at an affordable investment price.